Synopsis: A town’s leading citizen becomes a homicidal maniac after his wife deserts him. 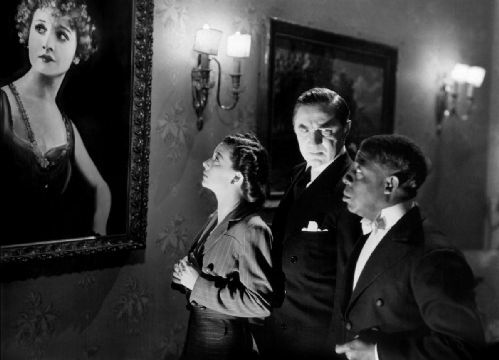 Due to the typical cheapness of the production, the entire movie takes place in or around the home of Mr Kessler (Bela Lugosi) and his daughter Virginia (Polly Ann Young), and opens on the anniversary of Kessler’s marriage to a wife who subsequently left him for another man. Each year on this day, the old boy talks to his wife as if she is still with him, much to the consternation of his butler, Evans (Clarence Muse) and the embarrassment of Polly, who instructs her boyfriend, Ralph (John McGuire) not to visit because of her father’s peculiar behaviour. Ralph turns up anyway, much to Virginia’s initial discomfort but his sympathetic response to her father’s condition convinces her that he is the man she wants to marry. Ironically, while she’s telling her father as much, Ralph is in the garden with Cecile (Terry Walker), the Kesslers’ maid, who, during a conversation which is overhead by Evans, doesn’t take kindly to the fact that he has brought their affair to an end. After a conversation with the new maid during which Jules the gardener (Ernie Adams) and Evans fill her in on the murders of a couple of servants that have taken place in the house over the past couple of months, Jules goes home. But before seeing his wife he visits his cellar where none other than the missing Mrs Kessler (Betty Compson) is residing. It seems she didn’t get very far when she left her husband. Her new beau, presumably in the midst of romantic rapture, drove their getaway vehicle straight into a tree, killing himself outright and causing some unspecified damage to Mrs. Kessler’s noggin. Why Jules is keeping her in the cellar is something of a mystery that is never explained. Every now and then, though, she goes for a stroll around the grounds of the Kessler house, and occasionally Kessler sees her standing in the garden in her dressing gown gazing up at him. For some reason, every time Kessler sees her he goes into some sort of trance which turns him into a homicidal madman who must kill! Kill! KILL! Kessler’s first victim — or at least the first victim we actually see him murder — is the unfortunate Cecile. Kessler invites himself into the young lady’s room to find her reclining in bed. Leering at the poor girl who is capable of doing nothing other than cower in her bed, Kessler removes his jacket — which proves to be his murder weapon of choice — and advances towards her and the camera. As he draws closer the jacket covers the screen, turning it black. But then, something that is both vaguely comical and creepy at the same time, occurs; Lugosi momentarily pulls the jacket back so that his mad eyes are visible at the top of the screen. It’s a strangely memorable moment, no doubt the idea of Lewis, who was nearly always a better director than his budgets allowed him to be, and is only one of a number of directorial touches which lift Invisible Ghost above the level of most other hack horror jobs of the 1940s. Remember that conversation between Ralph and Cecile? The one overheard by Evans the butler? Well, it returns to haunt Ralph in a major way because it provides him with a motive for her murder. With unseemly haste, Ralph finds himself in the shadow of the gallows, and not even the best efforts of Kessler and Polly can save him. But, hold on! This leaves the movie without a ruggedly handsome leading man! However will married screenwriting team Al and Helen Martin overcome such a major problem? Hey, come on, do you really think the writer of such classics as Bars of Hate (1935) and The Fighting Coward (also 1935 — clearly a good year for Al) can’t work around a simple little problem like that? Of course he can — all he has to do is give the luckless Ralph an identical twin brother nobody knew about who turns up unannounced during dinner. To be fair, that plot development is probably the stupidest thing about Invisible Ghost, but the picture does seem to entertain in spite of itself. There are so many unexplained details that this review is already growing longer than I intended because of them. Why, for example, does the not-all-there Mrs Kessler spend so many evenings peering through the windows of her former home while professing to be terrified of Kessler? Why does nobody else but the old man ever see her? Why does he always seem to see her but never recognise her? Why does the mere sight of her turn him into a homicidal maniac? Why does his manic trance cause him to walk around with one arm slightly extended? Why do the police force’s ‘finest minds’ (according to cigar-chomping police detective George Pembroke) never once suspect Kessler of the murders taking place under his roof? Despite all these questions, at 64 minutes, Invisible Ghost provides fast-paced mindless entertainment that proves to be remarkably mature in certain aspects, not least of which is the way in which the character of Evans is written. At a time when black people in the movies were stereotyped as fat, jolly Mammies or slouch-shouldered, drawling half-wits, Evans is written without hardly any regard paid to his colour. Lugosi’s character is also an unusually sympathetic one given that he is the villain of the piece — even if he doesn’t know it — and it’s impossible not to feel sorry for him by the movie’s end.